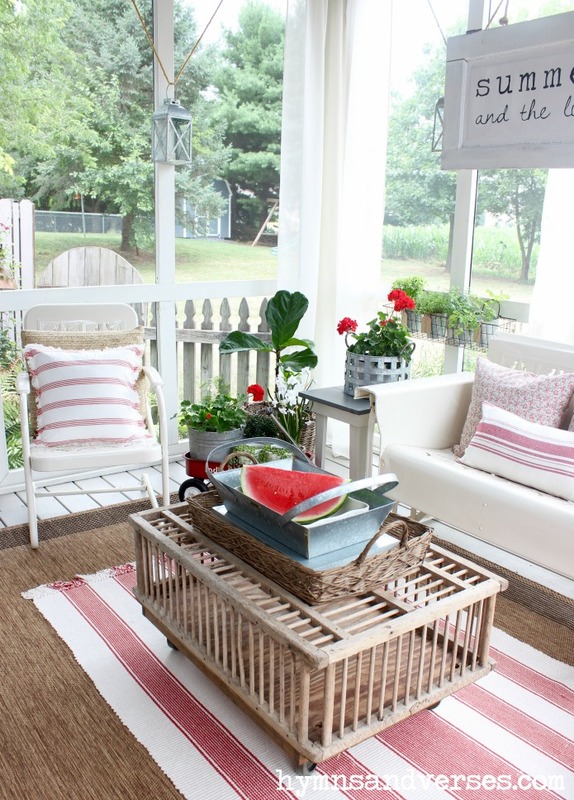 It’s a little late in the season, but I’m finally here today to share my Summertime screen porch! It took a little longer because I had a design fail! I had this amazing idea and then I had to wait for supplies to arrive and then there was lots of sewing involved and – once it was all in place – I didn’t like it! I mean, I waited days to see if the look would grow on me, but it didn’t! Basically, the fabric I chose for my curtains didn’t work well with the fabrics I used for my pillows. 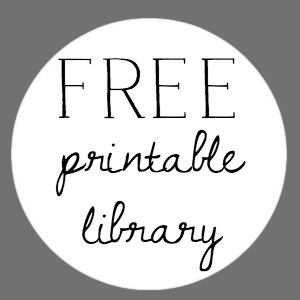 * This post contains some affiliate links for your convenience. Please see my full disclosure HERE. So, the curtains came down and I stitched up some plain gauzy curtains from the same fabric as my living room curtains. That made all the difference and I’m finally happy with how everything looks together! 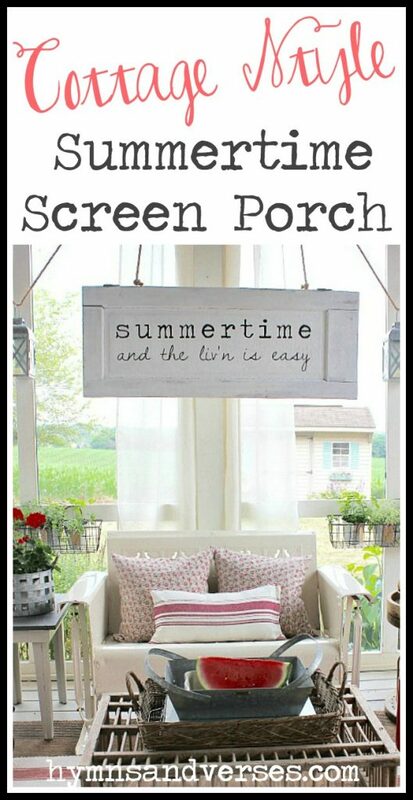 And, the “Summertime” sign is one I quickly made from an old cabinet door that I had in the garage! Can I just say I’m so thankful for a very patient husband who climbs up and down the ladder for his wife to hang curtains and a sign from the porch rafters! I stuck with a red and white color theme and a lot of the fabrics I used are from unique sources. The floral pillows above were made from napkins found at HomeGoods. You can make two pillow covers from a set of four 20 x 20 square cloth napkins. The striped pillow was made from two heavy weight cotton tea towels also from HomeGoods. I found this striped cotton rug that I love, even though I wish it were one size larger. And, I brought my DIY chicken coop coffee table out of storage and it’s the perfect size for the porch. I’ve had the straw porch pillows now for a few years and made another set of pillows using a set of fringed napkins from HomeGoods! All of the pillow covers came in under $10 a pair using the cloth napkins and tea towels! And, the fabrics are good quality! I picked up this watermelon to use in my photos and my family has waited patiently for me to finish so they can devour it! Don’t eat my props – ha, ha!!! I moved my fiddle leaf fig out onto the porch for the summer, hoping that the sun and warm temps will help it along. It’s still not growing much. 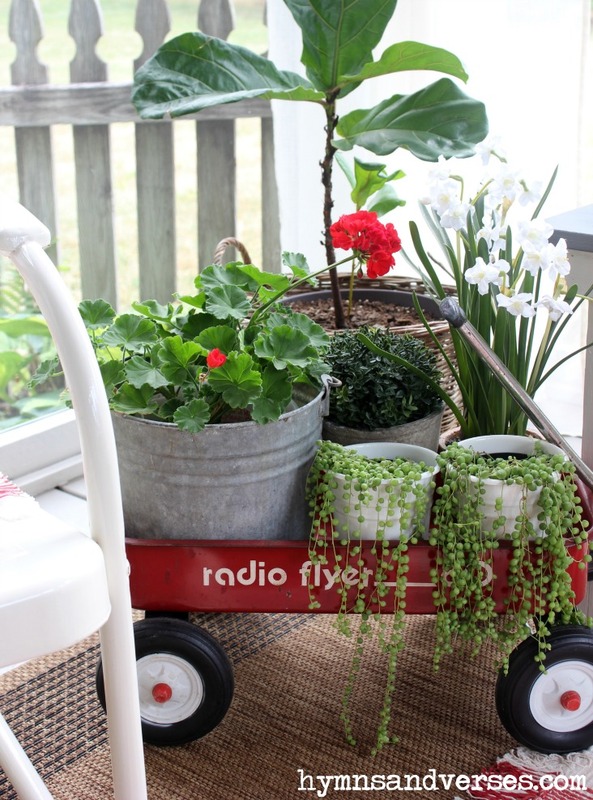 I also brought out my old radio flyer wagon and filled it with plants. 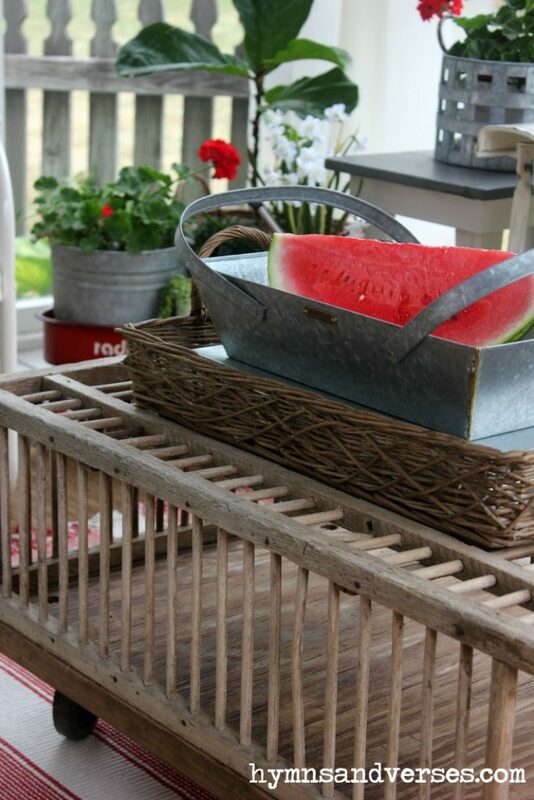 I found this adorable galvanized woven basket at one of my favorite local shops and filled it with red geraniums. You can see the basket better in some of the pictures above. And, I planted some fresh herbs in these small galvanized pots. I love the smell of the fresh herbs on the porch and since the porch is right off my dining room and kitchen, it’s super convenient to have them on the porch! 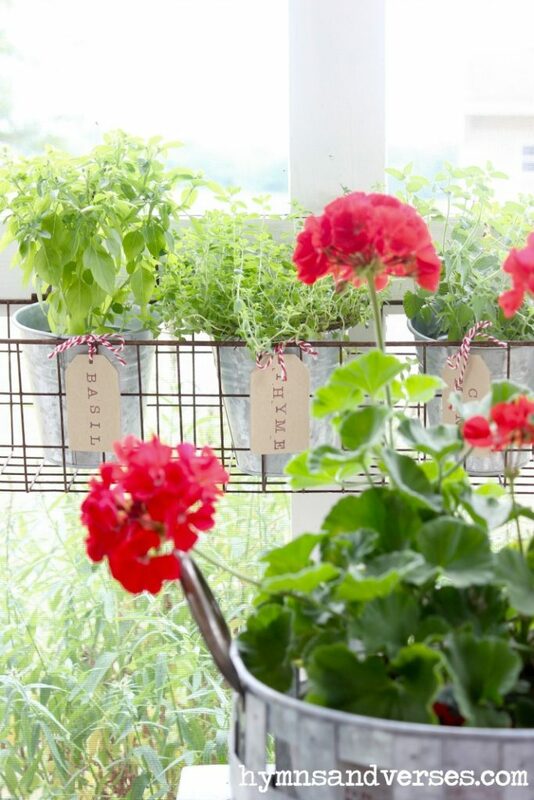 I made herb labels with chipboard hangtags and an alphabet rubber stamp set and hung them in front of each herb container with red and white baker’s twine. I like to make sure there are plenty of places to sit a drink when you’re out on the porch on a hot summer day. On this side of the glide I used an old wire spool from the local telephone company. They gave it to me for free a few years ago. 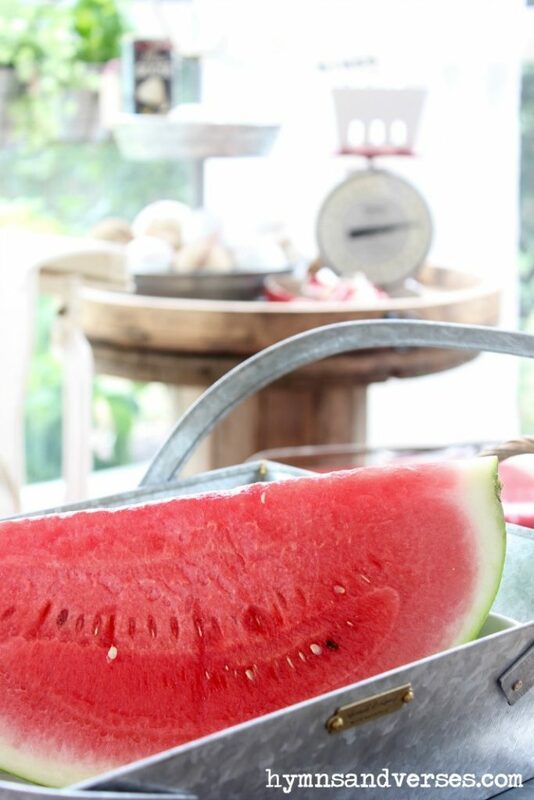 I topped it with my favorite round wooden tray from Mary and Martha and it’s the perfect fit! 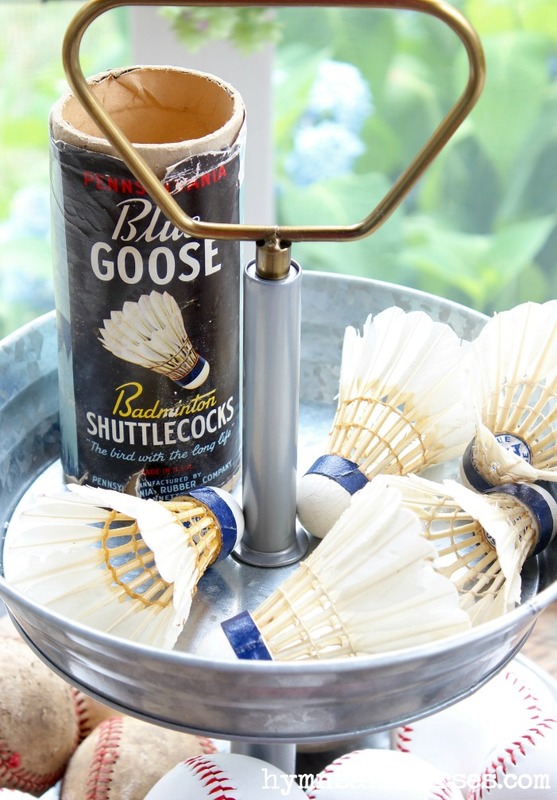 I found this two tired galvanized serving stand at Walmart and filled it with new and old baseballs and these amazing real goose feather badminton shuttlecocks that I found at a local antique shop! The red plaid pillow is one that I’ve had for a while. It was one that I made years ago out of a plaid tablecloth! As you can tell, I’m always stalking the table linen aisles for great fabrics! I found the striped throw on the swing at Target. I got a new light fixture for the porch and it’s also galvanized! It was an inexpensive addition that really updated the look. 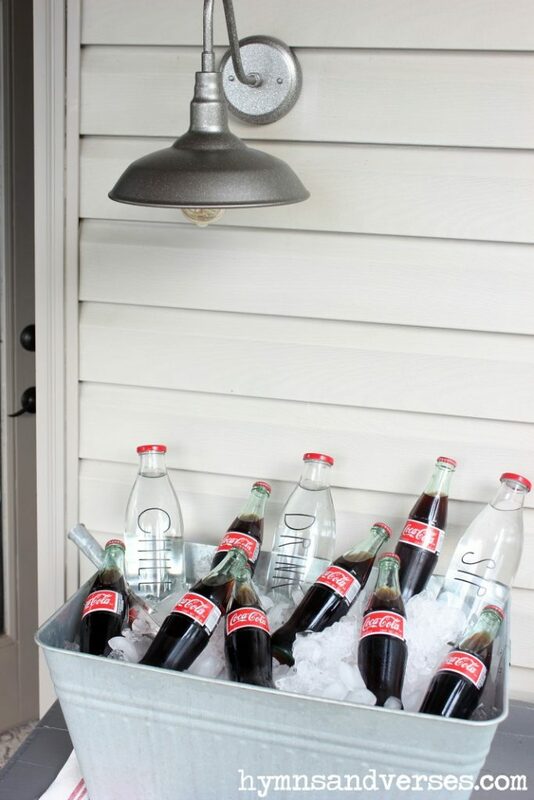 Here at the entrance into the house, I created a little drink station. I picked up the large galvanized tub at Walmart. It even has it’s own bottle opener! I made the “look alike” Rae Dunn bottles using $1 glass bottles from the Target Dollar Spot and black vinyl letters that I cut using my Silhouette Cameo cutting machine. 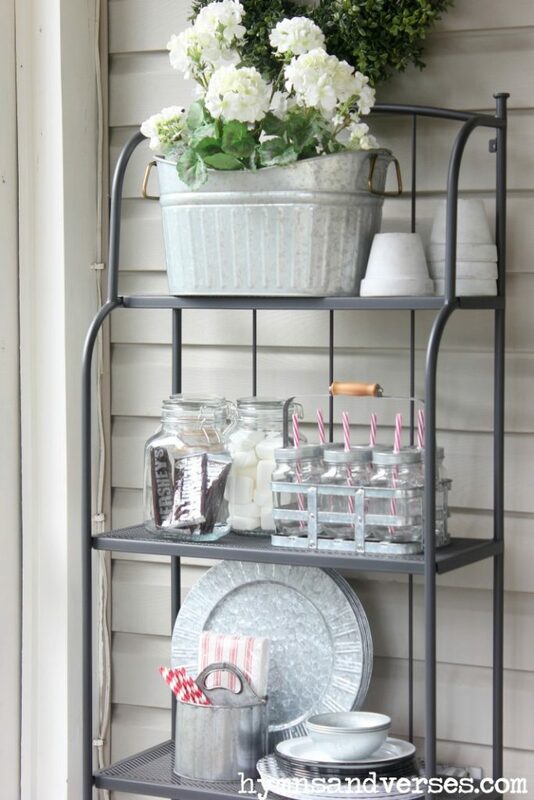 In the opposite corner, I purchased this inexpensive outdoor shelving unit from Ikea. 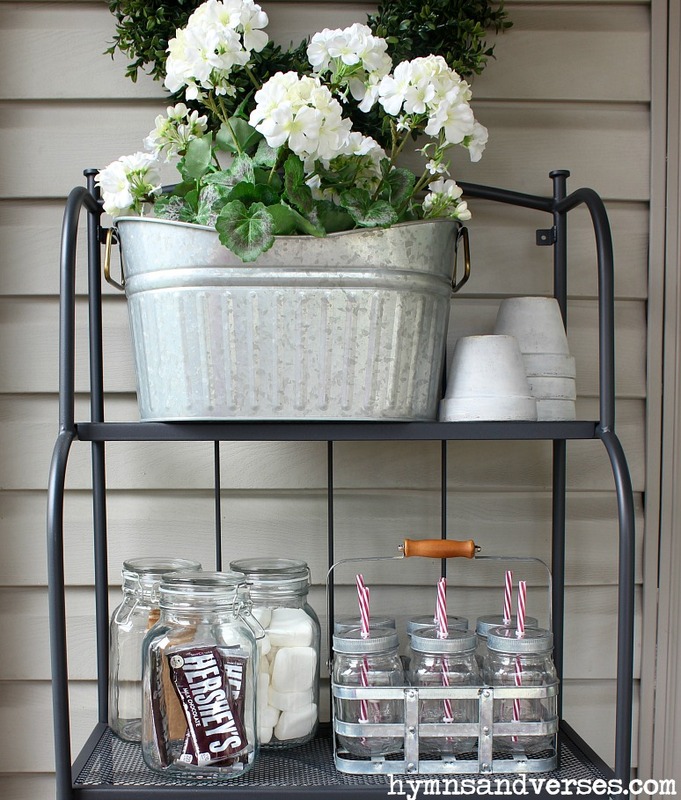 It’s the perfect size for this spot and holds a lot of supplies for outdoor entertaining! It’s sturdy, but also has brackets that you can attach it to the wall. 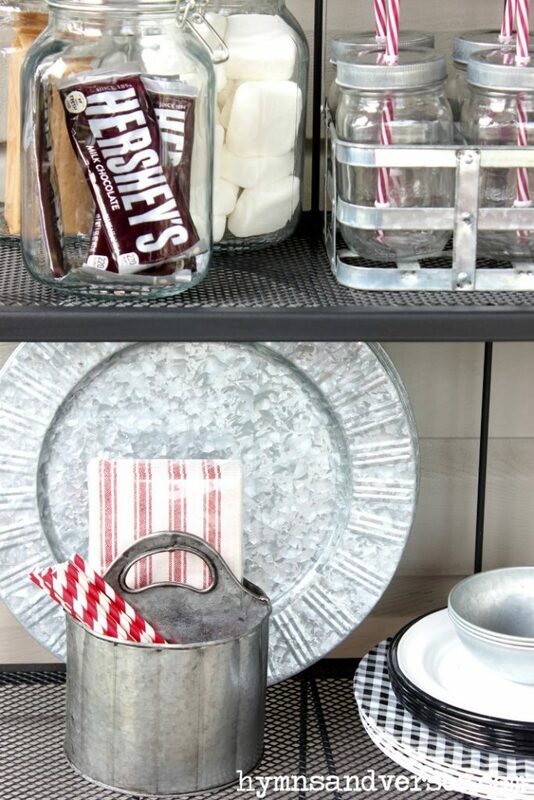 The top shelf galvanized container, glass drinking jars with galvanized carrier, and glass jars with marshmallows, chocolate bars, and graham crackers for s’mores are all from Walmart. More galvanized items – chargers from HomeGoods and small carryall for napkins and utensils from a local shop. The black and white gingham Melamine plates are from BigLots, the black and white enamelware salad or dessert plates are from Walmart. The small galvanized bowls came with the two tier galvanized serving stand I showed you above. Clearly, I have a thing for all things galvanized metal this year! And, one last thing that I almost forgot to mention – we hung these galvanized lanterns from the curtain rods with jute rope and I picked up some battery operated candles with timers for inside each one! Even thought it took me quite a while to pull this porch look together, I’m pretty thrilled with how it turned out! And, there’s still lots of summertime left to enjoy it! Did you know that tomorrow is Amazon Prime Day? 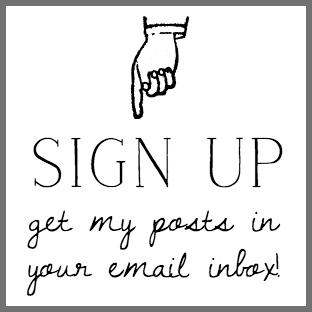 I have something exciting planned and I hope you’ll stop back tomorrow to see what it is! Your porch is wonderful. I love it all especially that glider and the swing. Everything is perfectly lovely. I have got some great ideas that I can use for next year. Our Canadian Walmart does not carry all the galvanized goodies like yours. That is too bad. 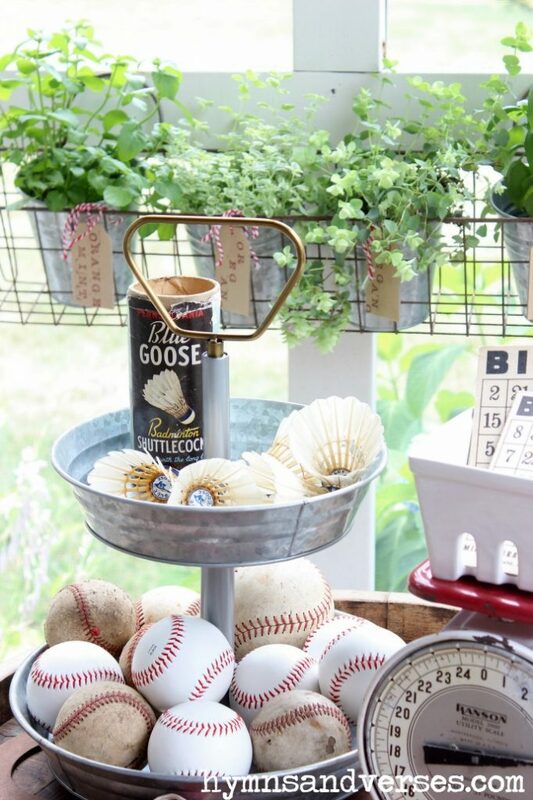 Where oh where did you find all the baseballs? I may have to start collecting a few! 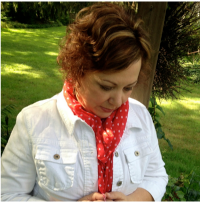 This is such a beautiful space, Doreen! I’ll bet your family and friends love gathering there! Beautiful view, too! Looks so inviting!!! Thanks for the ideas of using napkins and kitchen towels for pillow fabric!!! I have used placemats that are double sided before, just didn’t think of the other…duh!!! 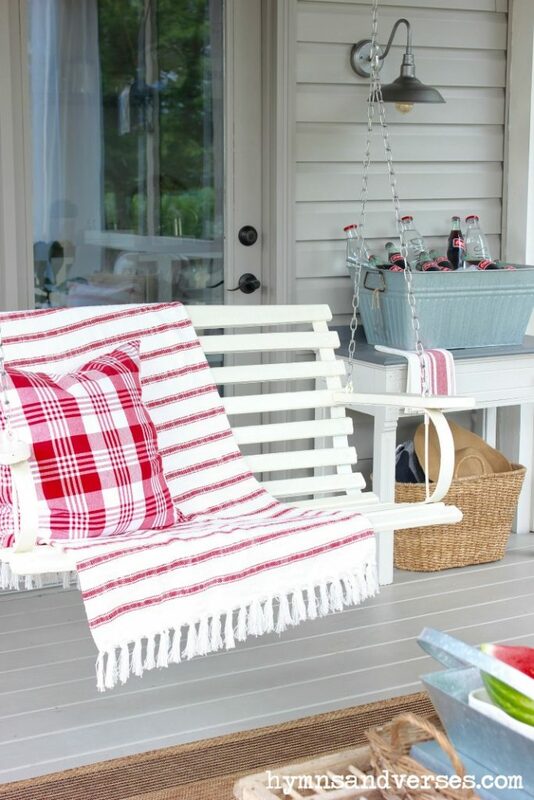 Your porch says “summertime” in every way. I really like your red and white decor. 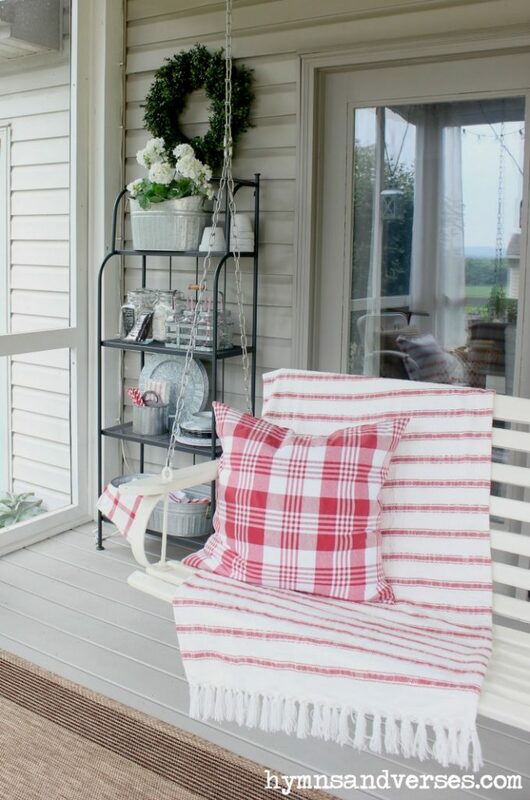 I am sure you and your family are spending lots of time on the porch – it is the perfect spot! Thank you for sharing all of your sources – I would like to know where you found your rug. 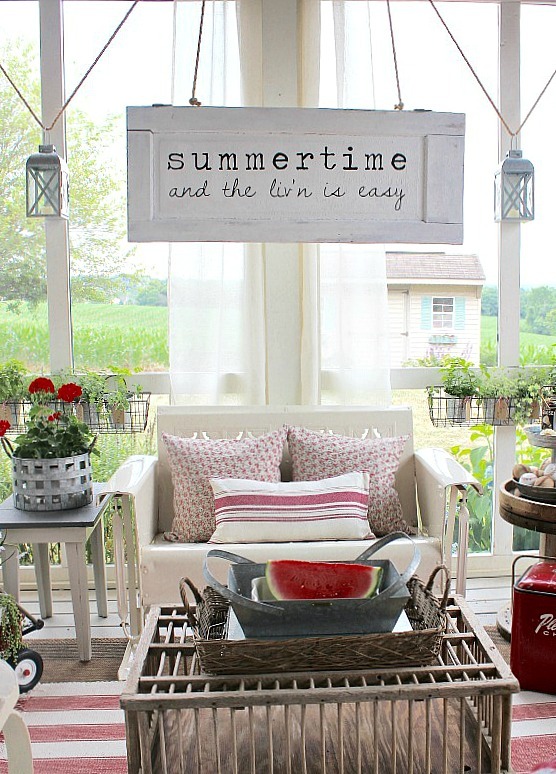 Love the whole look and especially your “Summertime” sign. Taking away so much inspiration for ideas I can use on my porch. Thanks for keeping at it until you got it right for you. Love it! I always love your porch designs and this did not disappoint. I am drawn to the vintage feel of this. I love old things. So many great ideas. 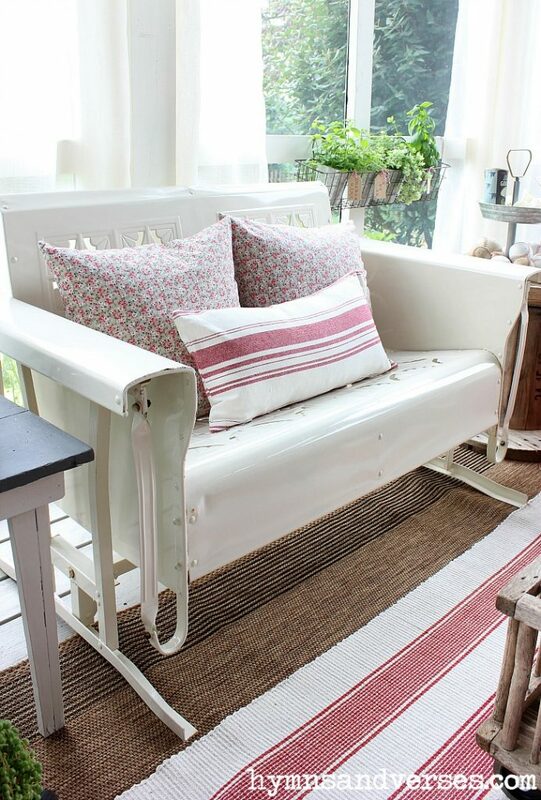 I love all of the galvanized with the vintage things. Absolutely adorable! I’ve liked all your summer rooms but this one takes the cake. I found this post in my spam!!! I check it occasionally and I was so surprised to find it there. I’m so glad I got to see the full reveal post. I love it all. One thing I like is the styled tall plant rack. It adds such interest to the setting. You always find the special touches like the rug used as a blanket throw and the dollar spot bottles with writing. I like the red wagon and can see that as your staple piece year round. 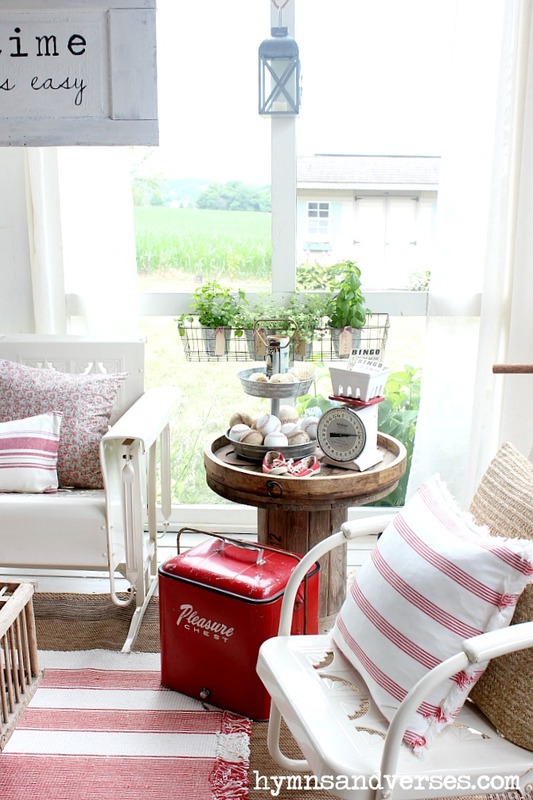 Don’t you love the vintage ice chest?!! We do! I was admiring this kind of light fixture to update my outdoor area. Yours looks great!!! 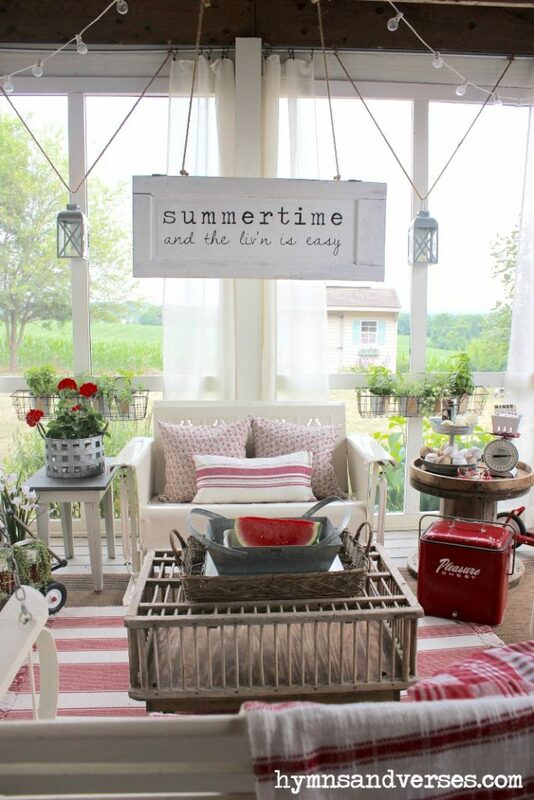 What a welcoming space to enjoy summertime tea!! So glad you did find it, Gwen!! !